Do you eat your words that mean food? Have you ever thought about how you describe food – your words that mean food? We use different words for appearance, flavour and texture of foods. We also have words that clearly identify whether food appeals to us or not. Having chewed over 90,000 plus words in writing my book, I am hoping that my choice of words will make what you eat a little more digestible and enjoyable. In this blog though, I am curious to know whether the words that mean food actually influence what you eat. These are just a few of the common and not so common words that mean food. How do you usually describe your food? It is hardly likely that you are going to eat a food that you consider ‘bad’. But what does bad really mean? I could mean that you didn’t like the taste of the food, or the food could have been spoiled or unsafe to eat. Tempting might indicate that the food you would like to eat carries some ‘guilt’ with it — does this make you eat more or less of it? 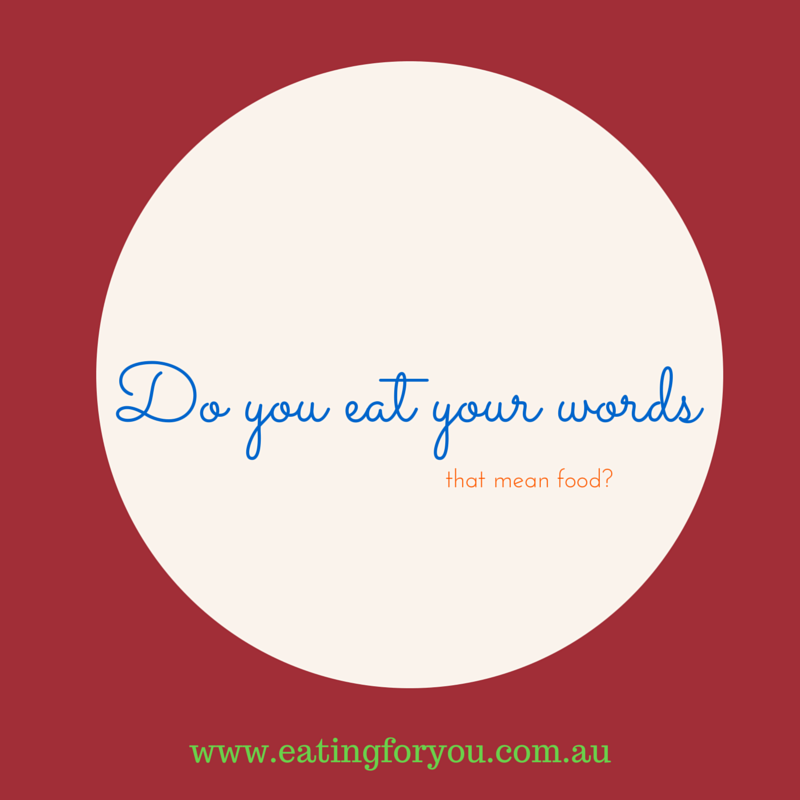 Do your words that describe your preferences for food support or detract from your health? Flavours are definitely words that mean food and direct what we eat. I often hear people say, “I prefer sweet foods’ and others will say “I am a savoury-type of person’. There a quite a range of flavours and words to describe them. The earthy description of food relates to foods that come from the earth, such as grains and vegetables. A favourite lunchtime meal in our household is the ‘earth sandwich’, made from wholegrain bread, tahini, hummus and various salad vegetables. From an Eastern perspective, the flavours of foods explain how food influences our health. ‘Sweet’ foods in Ayurveda and Traditional Chinese Medicine don’t exclusively refer to foods that are high in sugar, but rather to foods that a nourishing to the body e.g. root vegetables, whole grains and dairy foods. These Eastern approaches recommend that we base our food choices on nutritious sweet foods and add in sour, bitter, astringent and salty flavours. Salt is not recommended though for people with high blood pressure. Do you have a preference for certain flavours? Do you include sweet, sour, bitter, astringent and salty flavours in your meals? Textures can direct people’s choice of foods. I have a friend who loves crunchy foods, such as baked breakfast cereals and cracker breads. They really enjoy the crunchy sensation. I personally avoid slimy foods such as fungi. There are other textures that appeal to us at different times. For example, when you have nausea you often feel like a dry cracker or plain toast. In cold weather you might want a stodgy meal to satisfy your appetite, where as a light meal is preferable during hot weather. So textures also provide words that mean food. Do certain textures appeal to you? Does the texture of food influence what you eat? People can have preferences for the temperature of foods too. They can be very particular about how hot or cold their beverages are too. From a health perspective Eastern approaches generally recommend room temperature to warm drinks. Cold drinks can place a strain on weak digestive systems, as the body uses energy to warm them up. Likewise cold food, unless eaten in warmer weather or by a person with a strong constitution, places stress on the digestive processes. Certain foods are more appealing (and are safer) when eaten hot or cold. From a food safety point of view, if something is meant to be eaten hot then you should see steam rising from it, for example steamed or fried rice. Food bacteria multiply between 5–60oC, so it is important to store foods below 5 oC and ensure that you heat foods to well above 60oC. Do you usually have your drinks cold, cool, warm or hot? Do different food and beverage temperatures affect your digestion? Our food choices are also guided by other qualities that we seek from food. For some people only vegan choices mean food, others wouldn’t consider eating foods that were not organic or Fair Trade. At different times we may seek foods that we believe are refreshing or wholesome. In cold weather or after a day of heavy exercise or manual work we want hearty foods — foods that replenish the energy that we have expended during the day. Are there certain qualities that you seek from food? Without knowing it we have many words that mean food and direct us to eat or avoid certain foods. The above lists of words and questions are designed to help you to become more mindful of your food choices. Does the way you describe food influence your decision to eat (or not eat) it?